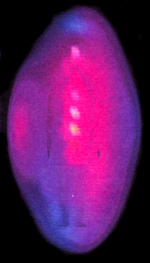 dark intrusions - aura of a person under psychic attack, mainly by negative mental projections of a significant other (onto her right side) and to a lesser degree by negative emotional projections (onto her left side). Immanuel Kant (1724-1804), German philosopher. Be yourself...everyone else is already taken. We all possess the capacity for leadership, but only those who cultivate it will ever become truly effective leaders. Humans have complicated every simple gift of the gods. Electromagnetic pollution may be the most significant form of pollution human activity has produced in this century, all the more dangerous because it is invisible and insensible. Dr. Andrew Weil (1942 - ), American Author and Physician, established and popularized the field of Integrative Medicine. 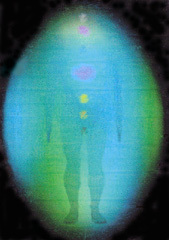 Human energy field inter-penetrates the body (cellular memory) and surrounds the body (aura). The energy patterns represent the blueprint for psychological, physical, spiritual and social aspects of one's Being. Everything that lives and exists has its energy field, which is the medium of universal silent communication. 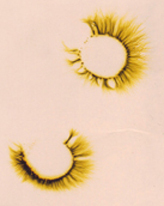 Individual energy fields influence each other at subconscious and transpersonal level. They are also inter-dependent with the environmental energy fields. Taking care of our own energy and keeping it healthy helps not only our own selves, but other people that we get in touch with, or even those at distance. Our state of health contributes to the environmental health and sustainability too. That is why I consider that taking proper healing care of one's own Being as a whole is ethical par excellence. All truth goes through three stages. First it is ridiculed. Then it is violently opposed. Finally, it is accepted as self-evident. At the beginning of life, babies feel their way. That natural orientation system seems to be based on sensing the energy as much as, or possibly even more than the world of mater. People are normally in some way aware of the energy patterns, under the name of vibes, impressions, inklings, hunches, sensations, emotions, intuition, thoughts, visions and dreams. Folk cultures have typically acknowledged the subtle energy reality and have integrated energy awareness into their traditions. Australian Aboriginal Dreaming is reflecting the awareness of the subtle realm as the blueprint of the material reality. Indian prana, Chinese chi and Japanese kiare the traditional names for subtle energy, used for healing and strengthening purposes (in martial arts). In some cultures the subtle energetic influence has been used for black magic. The Western mainstream culture did not up until recently encourage, but rather suppress (in the name of patriarchy, Inquisition, rationalism and hard reductionist science) the personal and collective awareness and healing management of one’s energy blueprint. In last few decades the energy awareness has been rapidly developed in Western mainstream culture. Modern spirituality, based on one’s own experience of the Divine, together with the personal growth and development movement that advocates the return to one’s authentic Self, have encouraged higher self-awareness and self-acceptance, which contribute to personal awakening to one's direct experience of the subtle energy influences. It is important to be aware of and learn how to manage in a healing way various energy influences, lest they become dis-easing. The scientific research (see page links) based on quantum mechanics has been consistently confirming the ancient traditional Knowing about the significance of the omnipresent subtle energy field and of the related 'psi' or psychic and spiritual phenomena, as well as their use in healing. In the former USSR the natural healing potential of psychic or energy healing has been researched and used in public hospitals.On the flip side of the coin, the military powers of the USSR, USA, France, UK and China have developed the use of 'psi' for spying and war making (see link David Morehouse). That indicates the very high importance of ethics in relation to using the energy potential for healing rather than for destructive purposes. While the traditional scientific paradigm is shifting slowly to encompass the new findings about energy fields and their application, people are voting by their feet and money for natural healing modalities, including various forms of energy healing and healing spiritual practices, as an appropriate pathway to their health and wellbeing. An ever increasing number of people who use the energy for healing themselves and the world keep increasing the global chances for sustainability and peace (see link Lynne McTaggart). By opening up to my full sensory and psychic potential, and by exploring the natural energy healing, I became aware of the detailed information represented by energy patterns. They are the blueprint for one’s psyche and body, psychic and spiritual realm, and past lives. I did not believe in last three aspects of existence until I understood from researching the energy phenomena how deeply dis-easing and/or healing they can be. That does not depend on the patient’s or my belief system. All energy patterns, corresponding to conscious, subconscious and past lives memories, are equally accessible for reading and healing if approached with an open mind. Since my energy reading assists the holistic healing, I consider that the information I am decoding is real. Then I adjust my beliefs accordingly, irrespective of what I or other people might have believed up till then. Only true understanding brings about the deep healing shift. False beliefs cannot and do not heal anything, only mask the symptoms. By energy reading I access the energy blockages that represent the root cause of any problem. They might originate from detrimental material, human, environmental or psychic influences, that were not processed in a healing way. That can create ill health and negativity which compounds the problem. Healing the energy blocks improves one's life force and self-healing potential, that enables the deep healing all kind of conditions, including those that have not responded to other types of treatment, and/or are deemed 'incurrable'. In the energy healing process, the relevant energy patterns appear in a specific, logical sequence. Like in archeology, the most recent energy memories form the top layer. They usually need to be healed fisrt in order to access the deeper and older layers. Those pertain to personal and family history, generic socio-cultural patterns, and past lives. It is also possible to mentally call for certain theme, e.g. self-esteem, as a thread running all through those layers, and reach the primordial root of the syndrome, tat might have been repeated in many ways through one’s lifetimes. It is a very effective way of healing long standing and tenacious dysfunctional patterns. Energy reading gives an insight into very specific information held at subconscious level about all the influences and circumstances responsible for any problem. That information, combined with what a patient is aware of, allows for a very precise holistic aetiology and diagnosis. It includes the psycho-somatic, socio-ecological, physical, psychic, spiritual and/or past lives factors. Uncovering the holistic aetiology and diagnosis is typically healing in and of itself. From energy point of view, the dis-easing process starts by an energetic interference or overwhelming one-sided energy communication, which breaks the naturally balanced bio-feedback loop by injecting into it an energetic ‘virus’ software. That hindrance at energy blueprint level induces physiological dysfunctions and psychological uneasiness, while increasing vulnerability to other difficult influences in material and subtle energy terms. yet she'll be constantly running back. The dis-easing energy patterns can be transformed so as to allow the restoration of the natural bio-feedback and psycho-feedback loops. Being the very principle of sustainable living, the two way energy communication, which is naturally inbuilt in those loops, is healing at psychological, cellular, psychic and spiritual level. Healing means ‘making whole’ – where the whole Being has been splintered by conditioning and/or having accepted (consciously or subconsciously) reductionist ideas and practices. True healing requires transcending reductionism by embracing the constructive relationship with one's own inherent nature and with the unknown. Then it is possible to stay open-minded and practice healing by attending to any combination of the relevant aspects of one’s being (physical, physiological, mental, emotional, intuitive, spiritual), at any level (personal, relationships, family, social, professional, financial, environmental, generic), in any context (material, energetic, psychic, manifested, imagined, desired, this lifetime, past lives). If my patients can not, do not want to, or believe that they have nothing to communicate, energy reading and healing provides a complete, systemic silent communication necessary to heal their ailments, including those that are deemed incurable (e.g. gangrene). The information about all human aspects is typically held in the aura as conscious, subconscious, cellular and/or super-conscious data bank. An increasing number of patients tell me that they had some inklings about such deeply seated information about themselves. Usually they refer to it as dreams, ‘deja vu’, or ‘irrational’ feelings, ideas and habits, often too deeply ingrained to be shifted by other means and modalities or changes in beliefs, lifestyle, relationships and career. 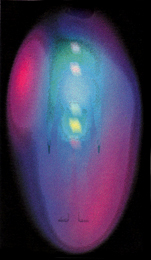 In energy healing it is not necessary that the patient be aware of all the information that I get from their aura. My patients who fall asleep during the session get the healing benefits that they came for, same as those who participate consciously in their healing with me. However, patient’s interest in and understanding of what I find in their aura contributes to their attitudinal healing and additional healing ripples in all areas of their life and in their natural environment, speeding up their holistic healing and personal evolution. Patient’s conscious limitations (lack of knowledge about healing and/or limiting beliefs and feelings) do not decrease the effectiveness of the facilitated energy healing when it is done with humble respect of and openness to the latent, albeit possibly unknown personal and universal healing potential. As a healer/therapist I resonate empathically with my patients and experience the healing process myself while working with them. I monitor my own healing process in parallel with theirs, since the totality of both their and my subjective experience during our work is relevant for a holistic appraisal of what is actually taking place and whether we need to adjust the course of action at any stage. Using my integral Intelligence (rational-intuitive-sensory-emotional-psychic-spiritual) while facilitating other people’s healing is important for their and my own healing benefit. If and when I tired to relay on my partial intelligence, e.g. rational only, the healing I could offer was less effective. Because the healing outcomes are obvious, immediate and lasting in the energy layer(s) that have been attended to in the session, my work is very fulfilling and energizing. That is my major criterion for assessing whether I am acting appropriately. If I feel otherwise in certain cases, which is very rare nowadays, I attend in a healing manner immediately to what might be my own issue triggered by my work experience, because I consider that I own it equally to myself and to my patients to be in the healthiest possible shape at all times. My healing intention consists in staying focused on the healing transformation of any energy blockages, while unconditionally supporting the person’s Pristine Self and its inherent holistic healing forces. I also call mentally for the appropriate universal healing forces to reinforce them. It is the web of Life that does the healing, while I facilitate it as appropriate. Healing thoughts are different from ‘positive’ thinking. So called ‘positive’ thoughts are not effective in healing if they are used to deny the perception of ‘negative’ reality. That is why many people unfortunately cannot heal themselves, no matter how much they want it. Trusting the wisdom of the unknown in each person’s healing endowment is essential for effective healing facilitation. Energy healing can be done mentally, with or without laying hands, irrespective of any particular belief system that one might adhere to and of the state of patient’s consciousness. Energy healing can be, but does not have to be combined with attitudinal and other forms of healing - it depends on each person’s preference. However, one’s conscious participation in personal healing speeds up the process, because it is empowering – which is healing in itself. By working at blueprint level, energy healing benefits all aspects of one’s being, both internally and in relationships with other people and systems. After having experienced energy healing, my patients typically report healing effects for issues and symptoms that they did not even mention to me. Conscious limitations do not decrease the effectiveness of energy healing when it is done with full respect of and humble call to the unknown personal and universal healing potential. While exploring energy healing I have stumbled across telepathic phenomena, which can be either healing or dis-easing. I action researched telepathic dis-easing influences in order to understand how they come into being, while I use healing telepathy successfully in my practice, including with patients overseas. From having experienced and witnessed telepathic communication with people, plants and animals, and also with 'inanimate' objects, as a precise and purposeful energy communication at any distance, I consider that it represents the universal silent communication of everything with everything else in existence. Truth is what is real, in material and energy terms, irrespective of whether one knows about it or not. Reductionist, homo-centric epistemology focuses on positive knowing while denying the existence of what it has not proved in its own way. I relay on pragmatic, integrative epistemology, for holistic healing and sustainability, which means that I work humbly with the Unknown as a partner (rather than a foe as positivistic epistemology might perceive it). According to my motto, Everything Comes Up For Healing, when life gives us a rough deal, that too comes up for healing. Thinking that activates powerfully the psycho-somatic healing forces when they are most needed. I consider that life is about learning to be increasingly appropriate for the highest wellbeing of all concerned. May your prosper in true wellbeing! As individuals in search of personal health and wellbeing change their orientation system so as to include the subtle reality and appropriate ways to heal and manage it, the whole Western culture is healing with an increasing momentum. It is helpful to keep that in mind when thinking about what is still, in human and environmental terms, waiting to be healed on planet Earth. Every though counts, in either dis-easing or healing manner, in energy realm. I consider mental hygiene – unconditionally holding the overall healing intention in one’s mind, even if one is not aware of how it is to happen – to be the highest personal responsibility at this stage of human development on the Planet. Appropriate action is necessary and needs to be upheld and reinforced by mental hygiene. Mentally setting up the healing energy blueprint makes such action much easier and more effective. It telepathically induces the powerful healing ‘coincidences’ and constructive shifts in individual and collective consciousness and manifestation in material reality.